U.S. Secretary of State Rex Tillerson on Tuesday offered to begin talks with North Korea without preconditions, while pointing to China to ramp up pressures against Pyongyang, including a complete oil embargo amid heightened tensions in the Korea peninsula. "We're ready to talk anytime North Korea would like to talk. 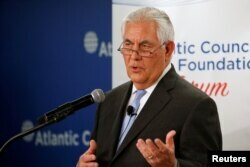 And we're ready to have the first meeting without precondition," said Tillerson at the Atlantic Council-Korea Foundation Forum on Tuesday, while adding there has to be "a period of quiet" for talks to begin, "or it's going to be very difficult to have productive discussions." "The president would like to see China cut the oil off," said Tillerson, adding the last time the North Koreans came to the table was because China halted its oil supply to Pyongyang. Former U.S. officials told VOA on Tuesday that such an offer is unusually candid amid increasing threats from North Korea’s nuclear and missile proliferation. "The one caveat he put on that was that there must be a period of calm because talks cannot proceed in earnest if missiles are being tested and nuclear devices are being exploded," said Dennis Wilder, who served as the senior director for East Asian affairs at the National Security Council under former President George W. Bush. Tillerson "clearly stated willingness to have unconditional talks with North Korea at high levels," said Robert Manning, a former State Department official and now a senior fellow on international security at the Atlantic Council, adding Tillerson did not speak from a prepared text. "The president's views on North Korea have not changed," White House press secretary Sarah Huckabee Sanders said after Tillerson's remarks. "North Korea is acting in an unsafe way not only toward Japan, China, and South Korea, but the entire world. North Korea's actions are not good for anyone and certainly not good for North Korea." At the United Nations, Undersecretary-General for Political Affairs Jeffrey Feltman told reporters that his visit to Pyongyang last week was "constructive and productive." Feltman, the highest-ranking American at the United Nations, was in Pyongyang from December 5-8. His visit was the first in-depth political exchange of views between U.N. and North Korean officials to take place in North Korea in almost eight years. FILE - U.N. Undersecretary-General for Political Affairs Jeffrey Feltman, center, walks upon arrival at the Pyongyang International Airport in Pyongyang, North Korea, Dec. 5, 2017. He met with Foreign Minister Ri Yong Ho and Vice Minister for Foreign Affairs Pak Myong Guk. Feltman said he did not request a meeting with Supreme Leader Kim Jong Un. "The North Korean interlocutors agreed it was important to prevent war," Feltman said. "How we do that, was the topic of 15-plus hours of discussions." He said he urged them to signal Pyongyang's readiness to consider the possibility of talks, but he received no commitments. "I think we have left the door ajar," Feltman said. "I fervently hope that the door to a negotiated solution will now be opened wide." Meanwhile, China is taking steps to prepare for the possibility of a mass inflow of North Korean refugees, according to the top U.S. diplomat, amid reports that China is constructing refugee camps along its northeastern border with North Korea. For years, one of China's goals of its North Korea policy has been centered on maintaining the stability of Pyongyang's regime. Beijing fears the collapse of the North Korean government would result in an influx of North Korean refugees. But media reports said China's Changbai County government is constructing refugee camps intended to accommodate North Korean migrants escaping a possible crisis on the Korean peninsula, citing a leaked internal document. "China is taking steps for such an eventuality, I think it is something that they can manage," said Tillerson, days after Chinese vice foreign minister Zheng Zeguang met with U.S. officials at the State Department. FILE - Zheng Zeguang, Chinese assistant minister of foreign affairs, speaks at a news conference in Chicago, Dec. 18, 2014. 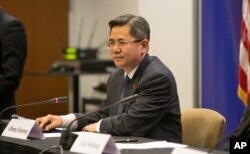 A State Department official told VOA Zheng discussed issues of shared interests, including the need to denuclearize the Korean Peninsula, in his meeting with Deputy Secretary of State John Sullivan last Thursday. Foreign policy experts said China seems to be preparing for all contingencies. "While I would not read into the move some sort of major shift or that Beijing believes massive migrant inflows are coming to Northeast China from a war or an oil embargo, it does seem Beijing does not want to be caught flatfooted," Harry Kazianis, director of defense studies at the Center for the National Interest in Washington, told VOA on Tuesday. Atlantic Council’s Manning told VOA there is a certain logic for China to prepare for a worst-case scenario. "It is very likely the China’s People’s Liberation Army has plans to move troops to the Korean side of the Yalu River to prevent North Korean refugees from streaming into China," said Manning. The Yalu River is on the border between North Korea and China. The top U.S. diplomat said the pressure campaign has achieved results that were not seen by previous efforts. "We’ve never had this level of extreme sanctions. When fully executed, this is going to deny North Korea about $2.3 billion of their export revenue – complete ban on coal, textiles, export of forced labor; import limitations on fuel and oil," said Tillerson earlier on Tuesday at a State Department Town Hall meeting. 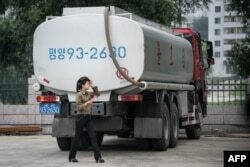 FILE- A petrol station worker walks past a fuel truck in Pyongyang, July 21, 2017. More than 22 countries have cut off their diplomatic ties with North Korea or sent North Korean diplomats back home, including Peru, Spain, Italy, and Portugal. A senior U.S. official said Tillerson plans to meet with top Canadian officials next Tuesday in Ottawa to address issues including North Korea’s weapon proliferation. The U.S. and Canada are members of the United Nations Command, a unified command structure for multinational military forces established in 1950 to support Korea during the Korean War. "If North Korea makes bad choices, … militarily we're prepared," said Tillerson, noting "that's not the path we want to take." The U.S. and Canada will convene a separate meeting that includes members of the United Nations Command Sending States on countering North Korea's threat to international peace. Korea and Japan are also invited to attend.